Lancaster RSPB Group is holding a number of talks in the meeting room near the Coffee Shop. Some meetings are daytime, others will be evenings as shown below. 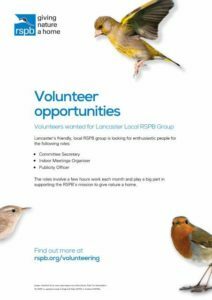 The meetings are open to all whether you are an RSPB member, a group member or not a member at all. Do come along and hear all about these fascinating subjects. 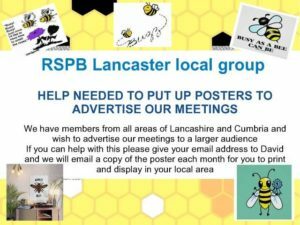 There are also some opportunities for volunteers to help on the committee and a request for help to display posters. An illustrated talk by Peter Holden, a wildlife author employed by the RSPB for many years, who also contributed to wildlife programmes on TV. He will speak about bird migration and new discoveries about the amazing journeys the birds undertake. An illustrated talk by Chris Winnick showing us the species that can be found in England and how conservation work is helping their numbers to increase. Meet at The Centre @ Halton. “Birdwatching & Wildlife in the Narbonnaise area”* – An illustrated talk by Philippa Benson who has lived for 15 years in this outstanding area of Southern France which is on the Western Mediterranean flyway. Meet at The Centre @ Halton. Stout footwear, warm clothing and packed lunches are recommended for field outings. If weather forecasts are poor, please ring 01524 241606 the previous evening before 9pm. The leader has discretion to cancel an event if the weather conditions are unfavourable. We hope that members will do their best to reduce car use by car-sharing as much as possible. If help is required to attend a meeting please email rspblancaster@gmail.com and we will do our best to assist. At indoor meetings marked * the RSPB requests a donation to help cover the cost of the event.